To help manage my shutdown anxiety I have spent the last couple of days away from the television, the computer, and the depressing barricaded and closed areas of downtown. I’m also trying to get in some exercise. After all, I want my work clothes to still fit when this $%&! is over. 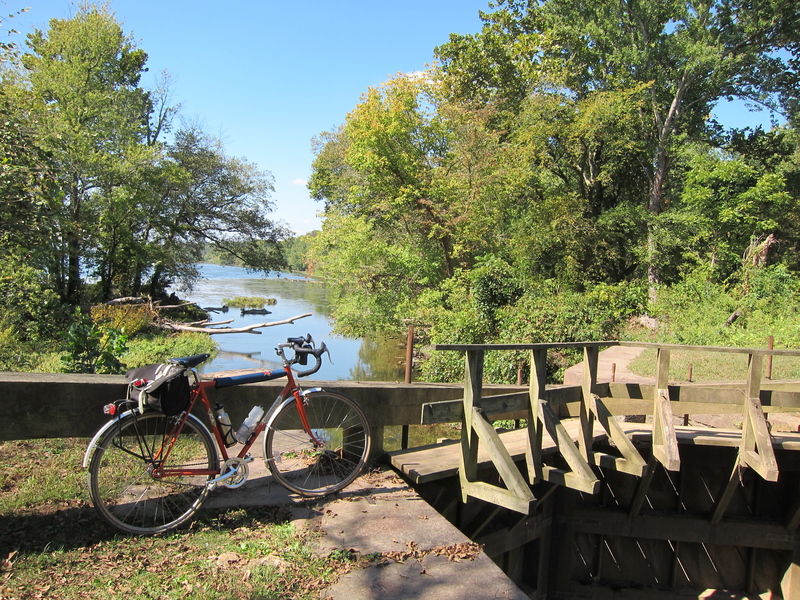 Today I took a little bike trip on the Leesburg Loop: the C&O out to White’s Ferry; over the Potomac via a ferry ride; roads to Leesburg; W&OD Trail; Custis Trail; and home. I picked up groceries in the last few miles so I could say I did one productive thing. The total mileage for the Leesburg Loop is about 85, give or take your starting point. The C&O is officially closed so if you tell anyone about this post I will deny it ever happened. In fact, this post will disappear from your browser 3 seconds after you finish reading it. C&O Towpath Status: The bathrooms are closed and the levers on all of the water pumps have been removed. 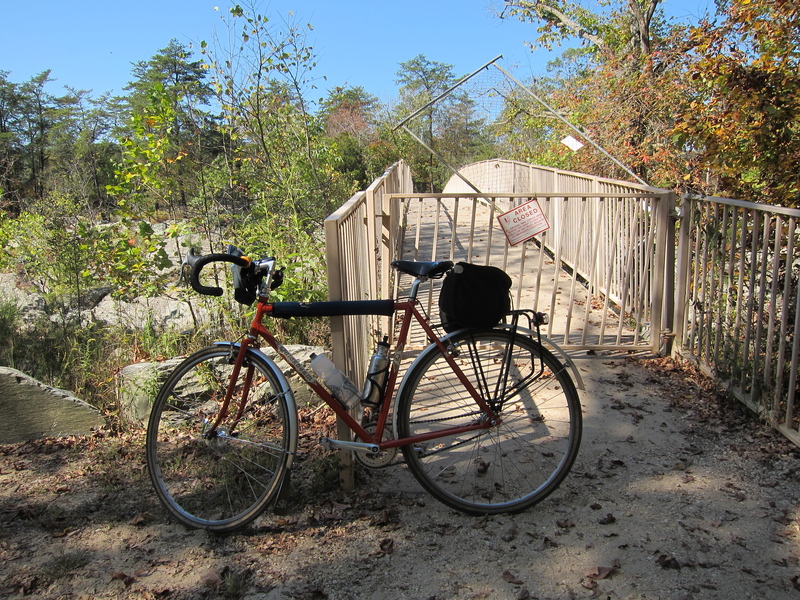 The Great Falls Overlook is completely barricaded. The White’s Ferry Store was open when I stopped there in the early afternoon. The store is just past the 35 mile marker. I don’t know the hours of the store. It offers drinks and snack-type items so… minimal provisions. The ferry is also running. Two bucks gets you from one side to the other. Great Falls Overlook- I don’t think so. Traffic is light on the C&O right now. Primarily I encountered GAP-C&O and C&O riders on their way into D.C. Regulars are out walking their dogs and there are a few visitors/touristy types. Mostly it’s quiet. 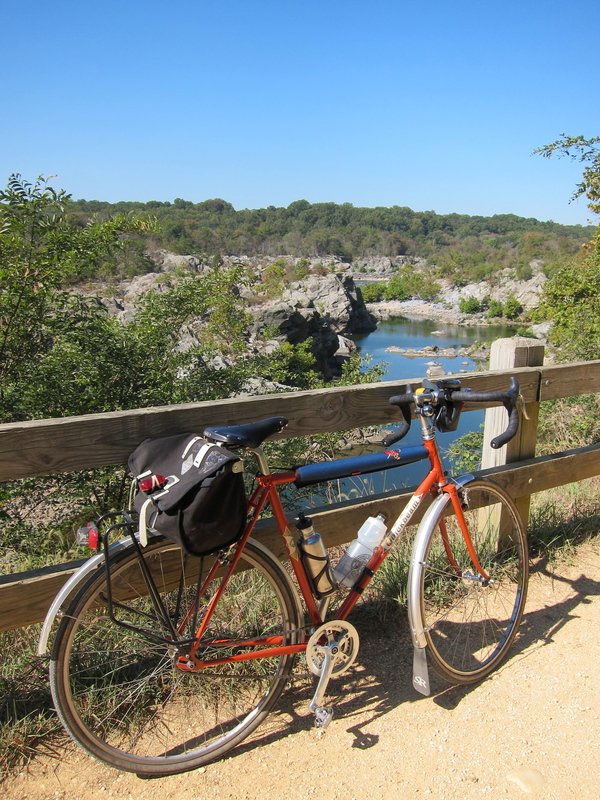 It’s difficult to stay in a bad mood on the C&O, except for the bumpy parts in the first 15 miles. Those can make for some surprising and uncomfortable moments. GAP-C&O Riders. Made my day to talk with these two. The C&O surface evens out after passing Great Falls, traffic is nill (even more nill now than normal) and it’s a meditative place to spend some miles. I love riding alongside the Potomac River under a canopy of tall trees and away from the cars. Leaves are falling onto the towpath and their gentle rustle entices. There is a sense of separation from the city and yet, the District remains so close. C&O. Mary’s Wall. Always gorgeous. I left the towpath at White’s Ferry, looping into Leesburg (this is the Leesburg Loop, after all) and back toward home. 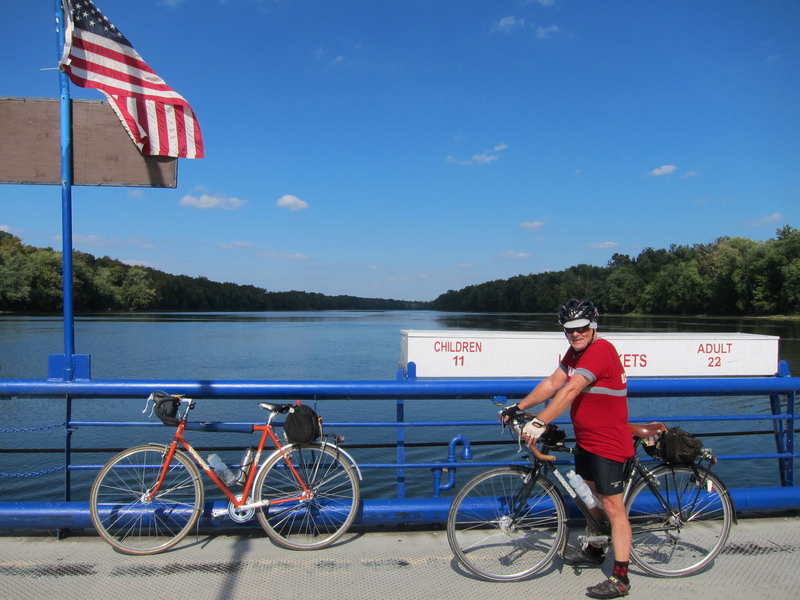 On the ferry I intersected with Bill, a D.C. Randonneur who was out doing a populaire. The W&OD Trail was not too crazy and I even met Tony, a #FridayCoffeeClub attendee and person who I frequently have encountered going the opposite direction on my commute. He was also taking advantage of a shutdown day. This ride might have been one I should not have done, according to the government shutdown rule book. However, the benefits I received from being on the C&O today were many, and I was reminded yet again of the beauty on this earth, some of it just beyond my front door. 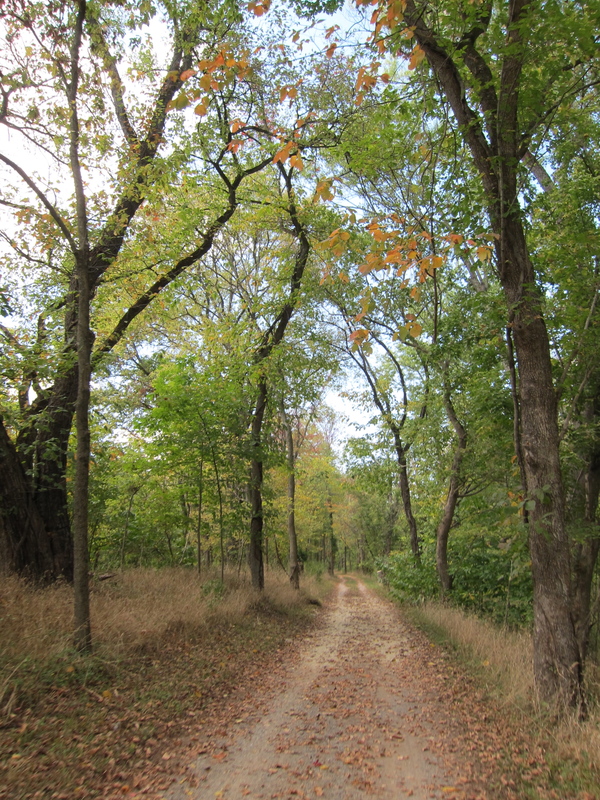 More photos from the Leesburg Loop here. Great day for a ride. You probably rode past the location of FMCC III in Herndon (Green Lizard Bikes) on the W&OD on the way back! Yes, I saw it but didn’t go in. How is that place and how would you rate the espresso? I like it. Service is very friendly and they do a good job on what I like to drink (drip coffee, americanos, smoothies). It’s becoming a nice neighborhood, commuter, and random passerby stop. Someone who drinks espresso (maybe one of the other FMCC3 attendees) will have to comment on that. Good mechanics and nice selection of bikes & cycling stuff and a 24-station CompuTrainer studio (HPC) in the back. MG, fantastic running into and riding with you today! Who would have thought the FCC crew could travel so far in different directions and still meet up! On the Green Lizard coffee I rate their espresso very good, enough so that I got a double shot on the way of and the way back. made me happier in spite of my feelings about the shutdown. Thanks so much for the CO report! Sounds like we are good to go next week for the ride down from Pittsburgh (that we’ve been planning since February). Sorry to understand that you’re furloughed, but glad you made the most of it. Unless things change you should be fine. Wish you well on your trip. The C&O is gorgeous right now. This is great shutdown therapy. Lets hope for all of us that the shutdown is short lived. How frequent is Whites Ferry. Why thanks! Ferry is around every ten to fifteen minutes I would estimate. Never saw the post, and will deny you were ever there. Sounds like a great ride though! Well done! And I’ve always considered barricades more of a guidleine than a rule! Glad to hear you are making the most of your down-time, the C&O looks lovely. So sorry that you and so many others are getting yanked around by this nonsense. I work for the county gov’t, and I share your frustration at sometimes being unable to do my job as well as I’m capable of because of some infighting further up the chain. Do whatever it takes to stay sane, and we’ll enjoy your adventures in the meantime. It seems we finished our GAPCO vacation just in time. 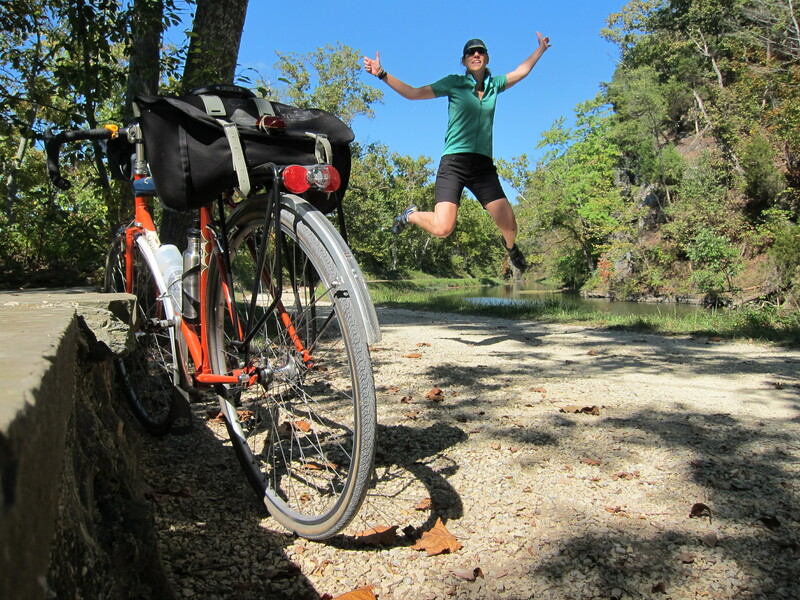 I love the C&O Canal and all the primitive campsites. Great Falls is well worth the walk to the end of the boardwalk. Pedal on. I know it must be incredibly stressful being shut down, and I am impressed that you seem to handle things with such aplomb while I must rant my way through! Jealous of your day out and about and REBELLING!!! Oh I am ranting. That’s why I have been trying to keep to myself. Ed’s been very patient. Hey MG – FYI – the Whites Ferry store also has a grill. I had an omelette, home fries, and a coffee there for breakfast this past Sunday morning. It will close for the winter sometime in late Oct-early Nov. 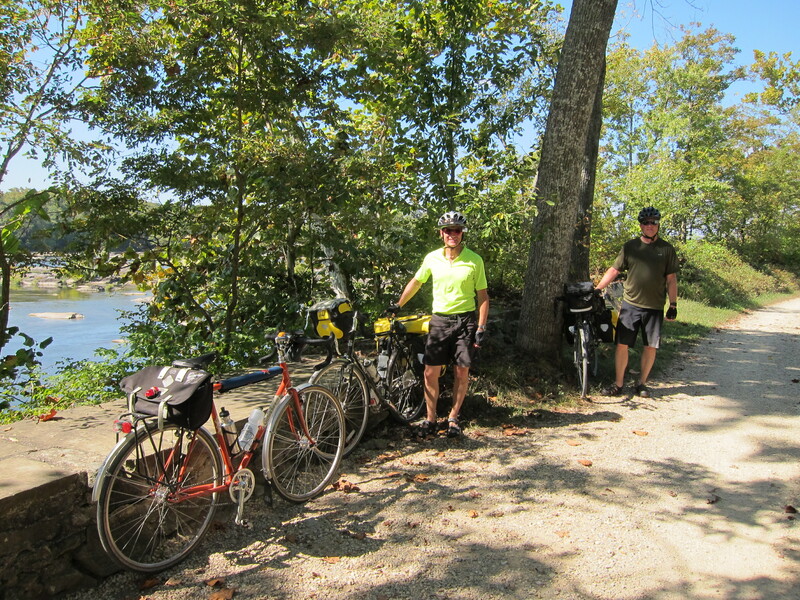 I rode and camped the GAP/Towpath last week and the towpath was very dry and dusty. With so many furloughed, was it less or more crowded than usual? It was quiet and peaceful for me except for the Great Falls area.